This cushion is designed for semi-permanent mounting to your office chair or your favorite chair around the house. A system of velcro mountings, positioner and straps lets you adjust the height of the cushion to perfectly fit into your lumbar area. Features a highly durable upholstery fabric cover. Also available as a Lumbar Back Pillow. 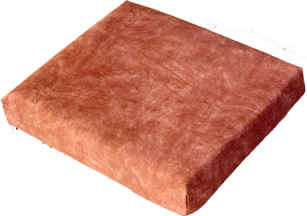 Get all the benefits of Supple-Pedic's unique Polyfilax technology for your seating comfort. Cushion is 16" x 18" with a height of 3". 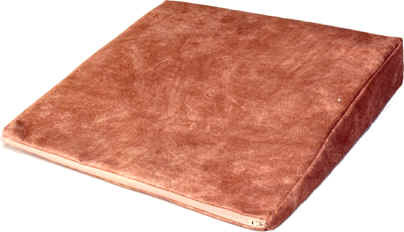 Features a highly durable upholstery fabric cover. This wedge-shaped cushion measures 16" x 16" and 3.5" high at the highest point. 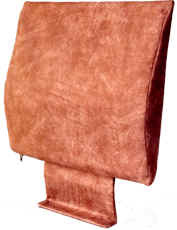 Features a highly durable upholstery fabric cover.